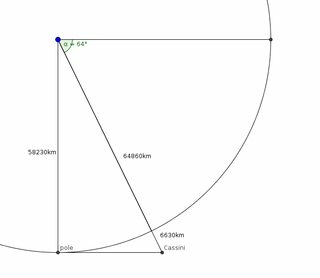 Why would Cassini need to reach 64 degrees inclination before “threading the needle”? The NY Times article Cassini’s Final Mission: Obliteration says that the Cassini spacecraft will end it's more than a decade long exploration of the Saturn system by raising the inclination of its orbit around the planet to about 64°, then orbiting between the rings and the planet 22 times before entering Saturn's atmosphere. To protect Titan and other potentially life-bearing places, Cassini’s final mission calls for its obliteration. 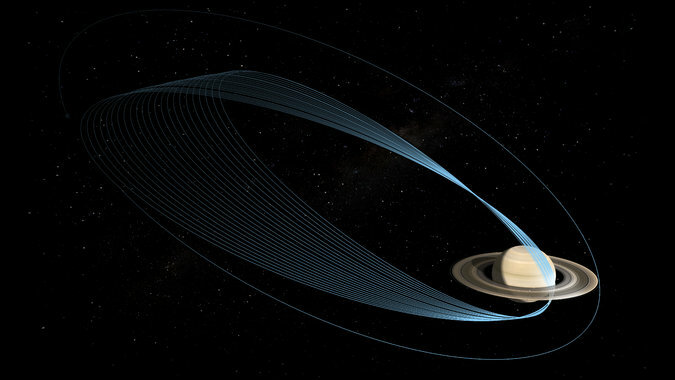 Researchers have dubbed the spacecraft’s swan song the “Cassini Grand Finale” because it includes an ambitious maneuver: 22 loops through the gap between Saturn’s surface and its innermost rings. Before launching Cassini, NASA drew up plans to dispose of it in Saturn’s upper atmosphere, but they only developed its elaborate end-of-mission maneuver in the past couple of years. Once they found that some of Saturn’s moons may be potentially habitable to life, keeping the probe clear of them as it ran out of fuel became crucial. Before Cassini can thread the needle through the planet’s gap, it must first reach the proper angle in its orbit. That means climbing to an inclination of approximately 64 degrees. The problem is that Cassini doesn’t have the power to propel itself to that position. ...Linda Spilker (is) the Cassini project scientist at NASA’s Jet Propulsion Laboratory in Pasadena, Calif. If you want to get a close-up of the polar regions with a lower inclination, like 40, 50 or 60 degrees, the altitude required is larger than the gap between Saturn and the innermost ring, and therefore not possible. Not the answer you're looking for? Browse other questions tagged orbital-maneuver flyby saturn cassini end-of-life . What will China's new “space station” in Argentinian Patagonia be used for? Delta-v obtained from Titan by the Cassini spacecraft; just how much of a “gas tank” was it? What are the “crossing beams of light” in the Cassini images taken during Enceladus plume flyby? How long will Cassini survive its dive into Saturn's atmosphere? Unravelling Cassini's “ball of yarn” orbit around Saturn, tabulation of propulsive maneuvers? What are the white streaks and specks in many of the Cassini images of Saturn? Is Cassini running out of fuel? What is the nature of a “flux tube” between Saturn and Enceladus, and what does “L‐shell=4” mean? How did scientists experimentally confirm that Saturn's ravioli-shaped moons had highly porous surfaces?